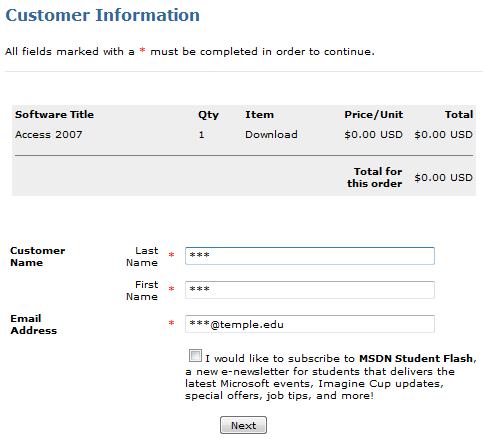 At the beginning of each semester, all students registered for at least one MIS course will receive an email message with account information for the customized Fox MIS MSDNAA Software Center. 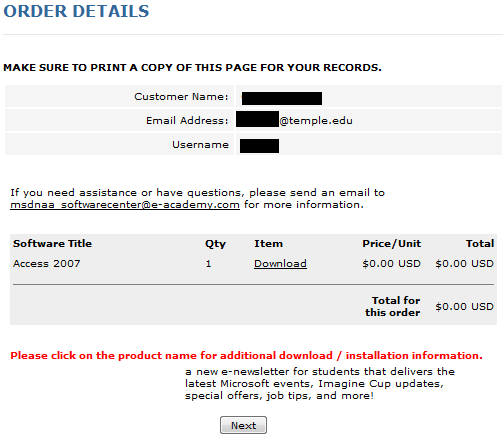 Use your account to directly download the software. Contact your professor if you have not received your login information (Search your inbox/junk mail first for the term ‘MSDNAA’). A current account on the MSDNAA Software Center site. A CD or DVD burner with software that burns .iso images or a software emulator. Note that the software that came with your computer almost certainly does burn .iso files, but may refer to them as ‘disc images’. 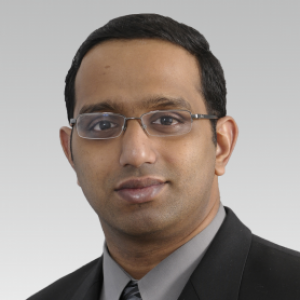 Start by logging into the MSDNAA Software Center. 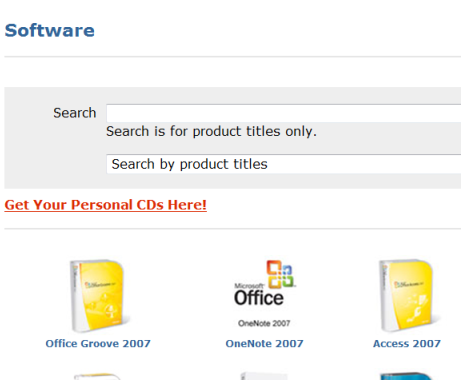 This brings you to the software page where you can select a product to download. The most common software used by MIS students is highlighted on the main page, but others are available by using the drop down list above or by using the search feature. Note that Microsoft Office is not available. Microsoft Access will be checked out in the example, which can be done by clicking its icon. 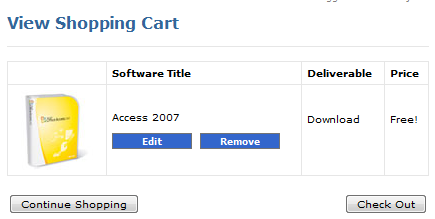 Select the download option and Access 2007 to your cart. Read the end user license agreement on the following page and choose to either agree or disagree to its terms. You must agree in order to proceed. If you want to download more software then click ‘Continue Shopping’, but click ‘Checkout’ if you only need one product right now. 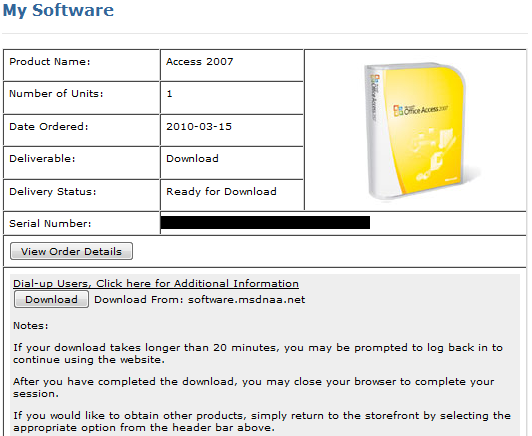 You will receive your product key and download link after clicking ‘Download’ on the order details page. Take note of your product key and click the Download button. 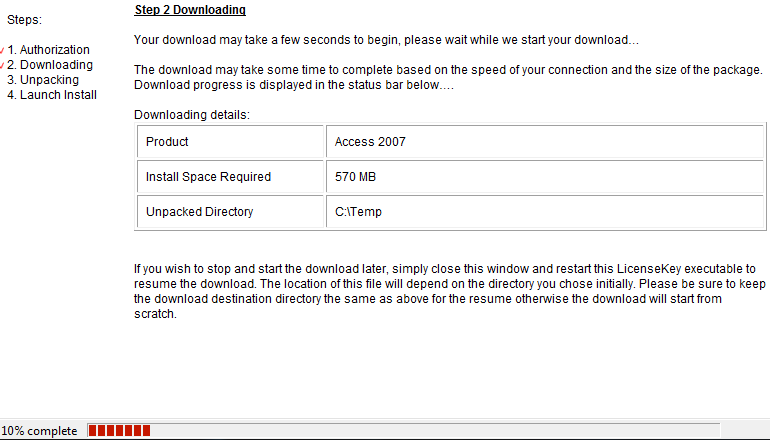 This will launch the download of a small .exe file that you should run after downloading. Choose a location in the first step and choose to continue. 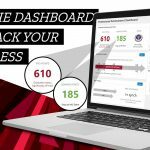 The download will begin, which will take anywhere from a few minutes to several hours depending on factors such as your Internet connection speed and the size of the product you’re downloading. When complete, select ‘Launch Install’ to be taken to the download location. You’ll see your software there in the .iso format, and your burning software may launch automatically. Open your CD/DVD burning software and select ‘Burn Disc Image’ or similar from the options. This will be different depending on which software you use. If you do not have a CD/DVD burner, then you can install from the .iso file using an optical drive emulator. Once the image is mounted you’ll be able to install the software like as you would with any other CD.